Launceston (/ˈlɒnsɛstən/ ( listen) or /ˈlɔːnsɛstən/ ( listen)) is a city in the north of Tasmania, Australia at the junction of the North Esk and South Esk rivers where they become the Tamar River (Kanamaluka). 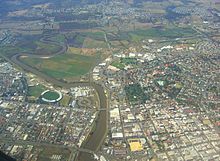 Launceston is the second largest city in Tasmania after Hobart and the thirteenth-largest non-capital city in Australia. Settled by Europeans in March 1806, Launceston is one of Australia's oldest cities and is home to many historic buildings. Like many Australian places, it was named after a town in the United Kingdom – in this case, Launceston, Cornwall. Launceston has also been home to several firsts such as the first use of anaesthetic in the Southern Hemisphere, the first Australian city to have underground sewers and the first Australian city to be lit by hydroelectricity. The city has a temperate climate with four distinct seasons. Local government is split between the City of Launceston and the Meander Valley and West Tamar Councils. The first white visitors did not arrive until 1798, when George Bass and Matthew Flinders were sent to explore the possibility that there was a strait between Australia and Van Diemen's Land (now Tasmania). They originally landed in Port Dalrymple (the mouth of the Tamar River), 40 kilometres (25 mi) to the north-west of Launceston. Initially the settlement was called Patersonia; however, Paterson later changed the name to Launceston in honour of the New South Wales Governor Captain Philip Gidley King, who was born in Launceston, Cornwall. The name still survives in the tiny hamlet of Patersonia 18 kilometres (11 mi) north-west of Launceston. Paterson himself also served as Lieutenant-Governor of northern Van Diemen's Land from 1804 to 1808. By 1827, Launceston's population had climbed to 2,000 and the town had become an export centre, mainly for the colony's northern pastoral industry. Small hotels and breweries began to emerge in the 1820s, before larger, more "substantial" hotels were built in the 1830s. Sporting groups, political groups, churches and schools were often established in these hotels; however, they also hosted plays, musical soirees and readings, until theatres were built. Ships from Launceston carried parties of sealers to the islands of Bass Strait early in the 19th century. They also took whalers to the coast of Victoria in the 1820s and 1830s where they established temporary bay whaling stations. Some of these temporary communities, such as the ones at Portland Bay and Port Fairy, were the forerunner of permanent settlement of those places. Walter George Arthur, who petitioned Queen Victoria in 1847 while interned with other Aboriginal Tasmanians on Flinders Island, lived for several years in Launceston as one of numerous homeless children, before being taken into custody by George Augustus Robinson who sent him to the Boy's Orphan School in Hobart in 1832. Newer popular team sports such as cricket and football failed to be sustained in Launceston before the population grew substantially. The sports were initially middle class recreations, as the working class found it difficult to participate after a six-day working week. Nevertheless, a "demand for facilities" lead to the upgrade of the Northern Tasmanian Cricket Association Ground (NTCA Ground) amongst other sporting facilities in the 1860s. Not long beforehand, Tasmania played Victoria in Australia's first first-class cricket match at the NTCA Ground in 1851. Launceston is at 43°27′32″S 141°8′41″E﻿ / ﻿43.45889°S 141.14472°E﻿ / -43.45889; 141.14472 in the Tamar Valley, Northern Tasmania. The valley was formed by volcanic and glacial forces over 10 million years ago. 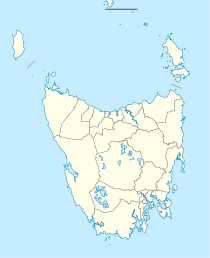 The city is approximately 45 kilometres (28 mi) south of the Bass Strait, with its closest neighbour-city being Devonport, approximately 99 kilometres (62 mi) to the north west. Launceston combines steep (originally heavily wooded) ridges and low-lying areas (originally wetlands – with parts of the suburbs of Inveresk and Invermay below high-tide level). As a result, areas of Launceston are subject to landslip problems, while others are liable to poor drainage and periodic flooding. The topography of the area is not conducive to easy dispersion of airborne pollution, due to the phenomenon of thermal inversion. During recent years the city's air quality has improved. Studies indicate that 73% percent of air pollution in Launceston and surrounding areas during the winter period is caused by wood smoke, while about 8% is from motor vehicle pollution. During the early 1990s about 60% of households used wood heaters, but since the mid 2000s only 25–30% of households use wood heating. According to the 2011 Tasmanian Air Monitoring report, particulate matter met the Air NEPM goals starting in 2006, and did not exceed the PM10 standard in the years 2009–2011. Launceston is situated at the confluence of the South Esk River and the North Esk River, forming the Tamar River estuary. It is used for commercial and recreational shipping and boating. In earlier years, oceangoing shipping used the river to obtain access to the Port of Launceston wharves located in the city centre and Invermay. The Port for Launceston is now located at the George Town suburb of Bell Bay, some 40 kilometres (25 mi) downstream on the east bank of the Tamar estuary, close to the river mouth. The South Esk River is the longest river in Tasmania. It starts in the North East Mountains near Roses Tier and flows through the Fingal Valley where it passes through the towns of Fingal and Avoca before flowing into the Northern Midlands where it flows through the towns of Evandale, Perth, Longford and Hadspen before finally reaching Launceston via the Cataract Gorge. The river is dammed at Lake Trevallyn on the upper reaches of the Cataract Gorge, with water being diverted into the Trevallyn Power Station with runoff flowing into the remainder of the Cataract Gorge and eventually merging with the Tamar River. The North Esk River starts in the Northallerton Valley in Tasmania's north-east mountains and winds its way to Launceston via the Corra Linn Gorge at White Hills. The St Patrick's River, the largest tributary of the North Esk, is dammed at Nunamara to provide the majority of Launceston's town water since the mid-1800s. Since the 1960s, parts of Launceston have been protected by a series of flood levees that reach up to 4 metres (13 ft) in height as large portions of the suburbs Invermay and Newstead sit within a flood plain. The last major flood occurred in 1929 when Invermay was completely devastated. More than 4,000 people were left homeless after just one night of flooding. Since then, there have only been minor floods. Work is under way on a $59 million flood levee upgrade that should protect the city from 1-in-200-year events, that is expected to take five to six years to construct. The council has acquired land used by eighteen businesses on the south side of Lindsay Street in Invermay, with businesses having until July 2009 to leave. In 2016 the Tamar River flooded resulting in the widespread flooding of low lying suburbs. The St Leonards and West Tamar Highways were temporarily closed as water levels rose, causing significant disruption to the city and loss of livestock. Launceston has an oceanic, temperate climate, with four distinct seasons. The city is located in the Tamar Valley and is surrounded by many large hills and mountains. With this type of topography, Launceston's weather patterns can change considerably in a short period of time. The warmest months are in January and February with an average air temperature range of 12.2 to 24.4 °C (54 to 76 °F). Throughout the year there is an average of 4.3 days a year over 30 °C (86 °F). The maximum recorded temperature was 39 °C (102 °F) on 30 January 2009, with Launceston Airport reaching 40.4 °C (105 °F) on that same day, during the 2009 Southeastern Australia heat wave. Winters are cool with minimum temperatures dropping below 2 °C (36 °F) an average of 61 days a year. The coldest month is July, with an average temperature range of 2.2 to 12.5 °C (36 to 55 °F). The lowest recorded minimum at Launceston's current weather station, Ti Tree Bend was −5.2 °C (22.6 °F) on 21 July 1991. Launceston very rarely receives snowfall, with snow falling in 1951 and 1986, and again on 3 August 2015, when most of the state received snowfall due to a cold front moving up from Antarctica. Winter, for Launceston, is also the season with the least amount of wind. Because of this and the topographical effect of the Tamar Valley, Launceston winters are renowned for foggy mornings, with Launceston Airport the most fog-bound commercial airport in Australia. The average annual rainfall, with moderate to low variability, is 665 mm (26 in), falling on an average of 88.4 days a year. The most rain Ti Tree Bend has received in a year was 829.6 millimetres (32.66 in) in 1992, though Launceston Airport received 953.1 millimetres (37.52 in) in 1956. As in most of Tasmania 2006 was the driest year when just 394.8 millimetres (15.54 in) fell. The Bureau of Meteorology reported that 2007 was the warmest year ever recorded in Launceston since temperatures were first recorded in 1884. Temperatures ranged from a minimum of 8.1 °C (46.6 °F) to a maximum of 19.2 °C (66.6 °F). During 2006 and 2007, Launceston had the hottest maximums throughout the state. In 2008, Launceston had the highest average maximum temperature out of all Tasmanian cities with 18.6 °C (65.5 °F). Many of the buildings in the City's central business district (CBD) were constructed in the nineteenth and early twentieth centuries, and Launceston is a major location of Federation style housing. Launceston's many well preserved Victorian and Georgian buildings (including the Launceston synagogue, a rare example of architecture in Egyptian Revival style) together with its diverse collection of art-deco architecture (such as Holyman House and Lucks Corner in the CBD, the former Star Theatre in Invermay and the former Launceston General Hospital) give the city an unusual period ambience. 20th Century examples of architecture that are part of the city include the Government offices of Henty House in Charles Street, the Police Station Building and the ANZ Building on the corner of Brisbane & George Street. This is at least in part a matter of deliberate policy – concerns that high rise development might compromise the essential character of the city centre have led to strictly enforced building regulations that restrict the height of new structures in the city, so that most buildings in the CBD have fewer than five storeys. A large portion of Launceston is contained within the City of Launceston local government area, although some outer suburbs are part of adjacent council districts: for instance Riverside and Legana are part of the West Tamar Council; Prospect Vale and Blackstone Heights are included in the Meander Valley Council. Launceston City Council meetings are held in the Launceston Town Hall. The Mayor of the City of Launceston uses the honorific the Right Worshipful. In 2002, Janie Dickenson became the youngest female elected mayor in Australia. The current mayor, Albert Van Zetten, who was initially elected in 2007, before being re-elected in 2009, 2011 and 2014. State Upper House seats that incorporate parts of Launceston are the Electoral Divisions of Paterson, Windermere and Rosevears. For federal elections, Launceston falls within the Division of Bass, with the sitting member being Ross Hart for the Australian Labor Party who won the seat in the 2016 election. The state Lower House seat is also called the Division of Bass, and is one of the five electorates in the Tasmanian House of Assembly. Both federal and state seats share common boundaries. The Launceston flag design is based on the city's Coat of Arms granted by the College of Arms, London on 11 June 1957. The Brisbane Street Mall, the War memorial at Royal Park, atop the Council Chambers and on top of the Albert Hall are places in the city where the flag is regularly flown. Flying the flag is restricted to Council Property. The three intersecting lines in the flag represent the city's three rivers (North Esk, South Esk and Tamar) and the two rectangles in the lines represent tin ingots. The strip across the top with the jagged edge is green to represent the city's parks, gardens and surrounding countryside. Waratah flowers at the top symbolise all flowers and similar beauties of nature. The ingots are included because Launceston used to be a large tin-smelting centre. The little circle at the river junction is Launceston. Along with being a major retail centre with an average of 75% of market share in surrounding local councils, Launceston is a major service centre for the north of Tasmania. The city is home to a campus of the University of Tasmania including the Australian Maritime College; and has a minor minerals and manufacturing base. Launceston is a major hub for the regional agricultural and pastoral activities. Historically, this has been connected with the growing of apples – in recent years the stress has moved to viticulture. Superfine wool remains an important part of the rural economy of north-east Tasmania and wool sales in Launceston attract many international buyers. The various agricultural industries in the district are supported by the Tasmanian Institute of Agricultural Research which operates the Mount Pleasant Research Laboratories in the Launceston suburb of Prospect. Launceston serves as the commercial hub for the north of Tasmania, and like many parts of the state, is becoming a major tourist centre. Visitors to the city have grown over the past few years: during 2004 Launceston attracted 412,800 visitors, up 51% from 2001. The United Kingdom is the origin of 25% of all international visitors to the city and 17% originate from the United States. The Cataract Gorge is Launceston's largest tourist attraction and is in close proximity to the city centre. It is home to the longest single span chairlift in the world, stretching 308 metres (1,010 ft) across the gorge. Launceston has many parks throughout the city including City Park, located next to the city centre. City Park is home to Albert Hall. The park also has a large enclosure for Japanese macaque monkeys, a gift from sister city Ikeda, Japan. The Launceston General Post Office dates back to the 1880s, with a clock tower added in the early twentieth century. The GPO clock chime chimes every quarter-hour. Tasmania Zoo, which is known for its wildlife conservation work, including a breeding program for Tasmanian devils, is located near the city. Launceston is home to the Queen Victoria Museum and Art Gallery, which was established in 1891. Now the largest museum located outside a capital city in Australia, the Queen Victoria Museum and Art Gallery is located at two sites across the city: the original purpose built building at Royal Park and another at the Inveresk Cultural Precinct, on the grounds of the former railway station and rail yards in buildings largely converted from the former Railway Workshops. The precinct also includes the Launceston Tramway Museum, which houses the No. 29 tram, the 'Mary St' shelter shed and a host of other memorabilia. The state's largest preservation railway, the Don River Railway, also has a carriage rebuilding workshop on the site. Australia's oldest bookshop, A.W. 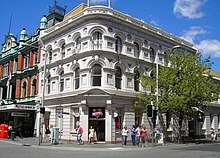 Birchall & Sons (Birchalls) dating from November 1844, is still located at its original site in Brisbane Street (now the Brisbane Street Mall). Located in the Southern Launceston suburb of Prospect, the Country Club Casino is a hotel, casino and golf course complex. It was the second casino to be built in Tasmania and one of the first in Australia. Launceston Aquatic, a $26.3 million regional aquatic centre was completed in July 2009. The site, just outside the central business district spans approximately 6,450 square metres (69,400 sq ft). From 1999 to 2003, Launceston was the home of three of the four Gone South music festivals. From 2006 to 2011, it hosted the MS Fest, a music festival held at the Inveresk Show grounds each summer to raise funds for multiple sclerosis research. This has since been replaced with the Breath of Life Festival from 2012 to 2014, a similar event held at the Inveresk show grounds to raise funds for lung cancer research. Launceston is also the host of the Junction Arts Festival. The Junction Arts Festival was first held in 2010, and spans five days in the Launceston CBD each year. The Festival program changes each year, and includes various art forms, including music, dance, visual and interactive art, short films and live performances, from local, national and international artists. Sport is a popular recreational and spectator activity in Launceston and like most of the state, cricket and Australian rules football are popular sports. The city has been the birthplace of two prominent Australian cricketers; the former Australian cricket captain Ricky Ponting and the retired cricketer and Australian selector David Boon. The first first-class cricket match played in Australia was at the Northern Tasmania Cricket Association Ground between the Melbourne Cricket Club and the Launceston Cricket Club in 1851. 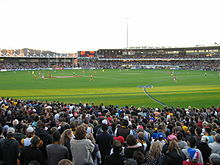 Australian rules football is very popular in Launceston, and is often played at York Park (University of Tasmania Stadium). Holding 20,000 people—more than any other stadium in Tasmania—York Park was swampland before becoming Launceston's showgrounds in 1873. Hawthorn has played between two and five AFL matches each season since 2001, and the St Kilda Football Club played two games a year between 2003 and 2006. In 2007, the Tasmanian Government signed a A$16.4 million, five-year sponsorship deal with the Hawthorn Football Club, under which the club will play four regular season games and one National Australia Bank Cup pre-season match at the venue each year. Throughout its history, York Park has hosted major pop concerts and other entertainments. Since 2001 it has been a venue for international sports events, and in 2005 was redeveloped at a cost of $23.6 million. Association football (commonly known in Launceston as "soccer") is also played and watched in Launceston [York Park]—the only place in Tasmania to have hosted national league soccer matches. A National Soccer League game was held at Aurora Stadium in 2002 between Perth Glory and Melbourne Knights. A-League's Melbourne Victory have held a pre-season cup game at the venue each year since 2006. The record crowd is 8,061. Launceston is not represented by an NRL Football Club or an AFL Football Club, though both sports have clubs playing at a local level. Rugby league football is played in the region at junior level and senior level, the Launceston Warriors play in the Tasmanian Rugby League and were minor premiers in the 2012-2013 season. Since 2004, the V8 Supercars (Tasmanian Challenge) has been annually held at the recently re-developed Symmons Plains Raceway, which is around 30 km south of Launceston. Marcos Ambrose, driver of the number 9 Richard Petty Motorsports car is most likely America's most notable Launceston native. A number of other sports have notable presence in Launceston, including basketball (men's, women's and indoor) and hockey. In 2009 Launceston redeveloped the city's swimming facilities which now include a modern indoor multimillion-dollar swimming centre at windmill hill, now named Launceston Aquatic. Launceston's local newspaper The Examiner was founded by James Aikenhead in 1842, and has been continually published ever since. The newspaper is currently owned by Nine Entertainment Co (Nine having merged with Fairfax Media in 2018). Along with the rest of the state, the city has four free-to-air television stations, including two government funded channels from the Australian Broadcasting Corporation (ABC), the Special Broadcasting Service (SBS) and two commercial stations; (Southern Cross Seven (7HD) & WIN (HD) These services are available in digital format as well as eleven digital-only stations, one carrying Nine Network programming (Tasmanian Digital Television (HD), and nationwide digital-only stations ABC Comedy/ABC Kids, ABC ME and ABC News (ABC), SBS Viceland and SBS Food (on SBS), 7Two and 7mate (on SC Seven), 9Gem and 9Go! (on TDT), and WIN Bold and WIN Peach (on WIN). Radio stations aired around Launceston are: LAFM and Chilli FM – part of the Grant Broadcasters radio network, TOTE Sport Radio – Racing Radio, Triple J – ABC, ABC Northern Tasmania – (ABC), ABC NewsRadio – (ABC), ABC Classic FM – (ABC), Radio National – (ABC), City Park Radio – Community Radio, SBS Radio – (SBS), Way FM – Christian Radio and 7RPH which is a relay of 864 AM from Hobart. Launceston General Hospital is Launceston's 300-bed public hospital, located just south of the city centre. Every year, LGH treats over 24,000 inpatients and over 225,000 outpatients. St Lukes Private Hospital and St Vincent's Hospital are the major private facilities. Launceston was also the location of the first use of anaesthesia in the Southern Hemisphere. Launceston is also the hub for the state's medical retrieval service. The Royal Flying Doctor Service supplies an aircraft and pilots under contract to the state's ambulance service and the aircraft (a Beechcraft Super King Air) is staffed by Ambulance Tasmania's IC Paramedics and doctors from the Launceston General Hospital. The car is by far the most dominant form of transport in Launceston, with the city having 721 km of urban and rural roads, even though much of the CBD has narrow one-way streets. 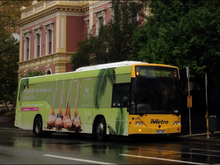 Since February 1998, Launceston has been serviced by the Tasmanian government-owned and operated public bus service Metro Tasmania. In addition, Redline offers school services and travels to many destinations across Tasmania. Because of its central location, Launceston is the hub of five of the state's major highways. The Midland Highway is the primary route to Hobart. The Bass Highway is the primary route to Devonport and Burnie. The Tasman Highway is an alternate scenic route to Hobart via Scottsdale, the East Coast, the West Tamar Highway and East Tamar Highway. The city is served by the small curfew-free Launceston Airport, 15 kilometres (9.3 mi) south-east of the city. The airport serves over one million passengers annually. Jetstar Airways, Virgin Australia, Sharp Airlines, Australian air Express and QantasLink all operate scheduled services at the airport. There are currently direct flights to and from Melbourne, Sydney and Brisbane. There is a freight rail system in operation which links Launceston to Burnie, Hobart and Bell Bay. The port is located on the Tamar river. Launceston operated a suburban tramway system between 1911 and 1952, which consisted of 29 trams. It was first conceived in 1909, after observations of efficiently working systems in Melbourne and Adelaide. A decade before the tram system was abandoned, Launceston had begun converting to trolleybuses, especially for the hilly routes. The Launceston trolleybus system was one of the most extensive of the various trolleybus systems in Australia. The tramway network was finally removed in 1952 to make way for cars and buses. A tramway museum in Inveresk is all that remains of Launceston's trams. Launceston's streets, most of which were planned in the early nineteenth century, were probably always too narrow for trams to be fully successful: in many cases little of the roadway remained for other forms of transport. The track gauge was 1067mm (3ft 6in). A regional passenger rail system operated in Tasmania, of which Launceston was a major hub; however, after many years of gradual retrenchment it was closed in July 1978. Launceston's electricity is primarily generated by renewable hydro electric power plants including the Trevallyn Power Station which is supplied with water from Trevallyn Dam. The major retailer is Aurora Energy. Historically, Launceston was powered by gas from the Launceston Gas Company, (later Gas Corporation of Tasmania). In 1988 it was sold to Boral. The first gas plant was built in 1860 as a horizontal retort Gas Works house made from brick and sandstone on the site's SW corner. This was followed by keepers cottages, labs, the Headquarters Building and the iconic 1930s vertical retort recognised by the wording "COOK WITH GAS" written in its brickwork. The Duck Reach Power Station replaced gas for street lighting when it was completed in 1895 (the first municipally owned power station in the Southern Hemisphere). Until the 1950s when Trevallyn Power Station was built, Duck Reach supplied Launceston with most of its power needs – it is now an interpretive historic site. The former Gas Works houses a Cafe. Launceston's water comes from the Launceston Water Catchment. The majority is sourced from St Patricks River, a tributary of the North Esk River which flows through Launceston. The main retailer is Ben Lomond Water. The first reticulated water supply constructed in 1857 still serves the CBD. There were fears that the Tamar Valley Pulp Mill might adversely affect Launceston's water supply. Like many Australian cities, several major companies provide mobile telecommunications services and wireless internet services to Launceston. Launceston's communication infrastructure was upgraded in 1997 through the federal "Networking the Nation" program. There are plans to upgrade further to a fibre optic network. Launceston has three sister cities. References using The Examiner may require registration for access. ^ Australian Bureau of Statistics (27 June 2017). "Launceston (Significant Urban Area)". 2016 Census QuickStats. Retrieved 6 December 2017. 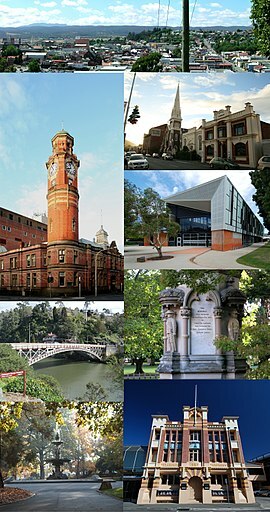 ^ "2011 Census Community Profiles: Launceston". ABS Census. Australian Bureau of Statistics. Retrieved 15 September 2016. ^ The Cornish Launceston is /ˈlɔːnstən/ or /ˈlɑːnstən/, with the "ces" elided (and sometimes the "t" as well). ^ a b Atkins, Ben M.; Vince, Joanna Z. (2009). "The Launceston flood policies: Levees and beyond". The Australian Journal of Emergency Management. 24 (3): 32–37. ISSN 1324-1540. Retrieved 2 November 2014. ^ "3218.0 - Regional Population Growth, Australia, 2011-12". Australian Bureau of Statistics. 30 April 2014. Retrieved 2 November 2014. ^ "Launceston". Discover Tasmania. Retrieved 13 August 2016. ^ "Launceston's Firsts". Launceston City Council. Archived from the original on 25 June 2009. Retrieved 10 July 2009. 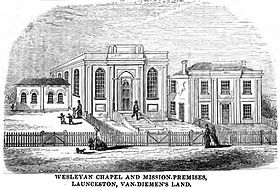 ^ "Wesleyan Chapel and Mission-Premises, Launceston, Van-Diemen's Island". Wesleyan Juvenile Offering. London: Wesleyan Missionary Society. XII: 66. June 1855. Retrieved 12 November 2015. ^ a b c d "History of Launceston". Launceston City Council. Archived from the original on 6 April 2010. Retrieved 2 November 2014. ^ "Logbooks of the Lady Nelson". Project Gutenberg. Retrieved 27 February 2009. ^ a b "Short Launceston History". Launceston Online Access Centre. Archived from the original on 11 August 2008. Retrieved 29 August 2008. ^ Evans, Kathryn (1993). Shore-based whaling in Tasmania historical research project: Volume 2; site histories. Hobart: Parks & Wildlife Service. p. 67. ^ Green (2006), p. 8–13. ^ Wooley and Tatlow, p. 1. ^ "Geography of Launceston". Asia Rooms. Retrieved 4 January 2009. ^ "Driving Times". Tourism Tasmanian. Archived from the original on 13 February 2009. Retrieved 4 January 2009. ^ "Launceston topography and meteorology". State of the Environment (SoE) Tasmania. Archived from the original on 29 July 2008. Retrieved 16 September 2008. ^ "Air quality for Launceston and the Tamar Valley". Launceston City Council. Archived from the original on 10 October 2007. Retrieved 31 October 2008. ^ "History of Air Quality in Launceston". Launceston City Council. Archived from the original on 23 July 2008. Retrieved 31 October 2008. ^ "Tasmanian Air Monitoring Report 2011" (PDF). Standing Council on Environment and Water. June 2012. Archived from the original (PDF) on 2 November 2014. Retrieved 2 November 2014. ^ Tim Walker (21 February 2011). "Flood levee vital for Launceston". ABC Northern Tasmania. Retrieved 9 August 2011. ^ "LCC compulsorily acquires land for flood levee project". Australian Broadcasting Corporation. Retrieved 1 November 2008. ^ "$20m blow-out in Launceston levee costs". The Examiner. Retrieved 3 July 2009. ^ "Supervising Scientist Report" (PDF). Australian Government. Department of the Environment, Water, Heritage and the Arts. p. 4. Archived from the original (PDF) on 18 March 2009. Retrieved 31 January 2009. ^ "Snow falling across Tasmanian beaches". skynews.com.au. Sky News. Retrieved 3 August 2015. ^ a b "Climate of Launceston". Australian Government. Bureau of Meteorology. Archived from the original on 22 February 2009. Retrieved 26 July 2008. ^ "Tasmania breaks all-time high temperature record again". Australian Government. Bureau of Meteorology. 30 January 2009. Retrieved 31 January 2009. ^ "42.2 deg: Scamander sets State's hottest record!". Fairfax Media. The Examiner. 31 January 2009. Retrieved 31 January 2009. ^ "Climate of Launceston". Australian Government. Bureau of Meteorology. Retrieved 2 September 2008. ^ "Tasmania in 2007". Australian Government. Bureau of Meteorology. Retrieved 28 July 2008. ^ "Tasmania in 2006". Australian Government. Bureau of Meteorology. Retrieved 1 November 2008. ^ "Climate Statistics for Launceston". Bureau of Meteorology. Retrieved 28 October 2017. ^ "Climate Statistics for Launceston". Australian Government. Bureau of Meteorology. Retrieved 5 November 2016. ^ "The changing landscape of Launceston documented in oil". ABC News; Australian Broadcasting Corporation. Retrieved 21 January 2008. ^ "Vision 2020" (PDF). Launceston City Council. Archived from the original (PDF) on 26 March 2012. Retrieved 2 November 2014. ^ "Launceston City". Launceston City Council. Launceston Tamar Valley Tasmania. Archived from the original on 19 October 2008. Retrieved 17 September 2008. ^ Negus, George (4 February 2003). "New Dimensions, Women High Achievers - Episode 9: Mayor Janie Dickenson". Australian Broadcasting Corporation. Archived from the original on 2 December 2014. Retrieved 2 November 2014. ^ "Coat of Arms". Launceston City Council. Archived from the original on 22 July 2008. Retrieved 16 August 2008. ^ "Issues for Community Comment: Chapter 1 - The Launceston Context" (PDF). Launceston City Council. October 2007. Archived from the original (PDF) on 3 November 2014. Retrieved 2 November 2014. ^ "Tasmanian Economy Reports". Tasmanian Government. Archived from the original on 20 July 2008. Retrieved 28 August 2008. ^ "Retail Strategy for Launceston City" (PDF). Launceston City Council. Archived from the original (PDF) on 25 July 2008. Retrieved 4 September 2008. ^ "Cataract Gorge Reserve". Launceston City Council. Archived from the original on 2 November 2014. Retrieved 2 November 2014. ^ "Cataract Gorge Reserve". Pure Tasmania. Archived from the original on 24 July 2008. Retrieved 2 September 2008. ^ "Launceston and NE". Archived from the original on 28 February 2008. Retrieved 8 November 2008. ^ "Commonwealth heritage places in Tasmania". Department of the Environment, Water, Heritage and the Arts. Australian Government. Retrieved 14 November 2008. ^ "Our Zoo". Tasmania Zoo. Archived from the original on 29 December 2008. Retrieved 12 January 2009. ^ "Queen Victoria Museum and Art Gallery". QVMAG. Archived from the original on 13 January 2008. Retrieved 14 January 2008. ^ "Queen Victoria Museum and Art Gallery". Launceston City Council. Archived from the original on 2 March 2009. Retrieved 22 January 2008. ^ "Tribute's for Launceston's mayor". ABC News. 26 November 2001. Archived from the original on 27 February 2009. Retrieved 27 July 2008. ^ "Birchalls – About us". Archived from the original on 22 August 2007. Retrieved 25 March 2007. ^ "Launceston Aquatic Centre". Archived from the original on 20 July 2008. Retrieved 10 September 2008. ^ "Launceston Aquatic". Launceston City Council. Archived from the original on 2 March 2009. Retrieved 22 January 2008. ^ "Official name and partner announced for Aquatic Centre" (PDF). Launceston City Council. Archived from the original (PDF) on 2 June 2009. Retrieved 22 January 2008. ^ "MSFEST". Tasmanian Government. Archived from the original on 22 July 2008. Retrieved 22 January 2009. ^ Group, S. (19 September 2018). "About Junction". Junction Arts Festival. Retrieved 19 September 2018. ^ Group, S. (19 September 2018). "Program". Junction Arts Festival. Retrieved 19 September 2018. ^ "Tasmania V Victoria". Retrieved 28 August 2008. ^ "NSL 2001–2002, Round 20". Ozfootball.net. Retrieved 10 June 2008. ^ "Football spreads its reach". A-League website. 2 May 2008. Archived from the original on 17 June 2011. Retrieved 10 June 2008. ^ "V8 Tasmanian Challenge". Archived from the original on 13 September 2009. Retrieved 29 August 2008. ^ "Launceston Australian News Media". Mondo Times. Retrieved 22 January 2009. ^ "FM Radio Tas". Aus Radio. Archived from the original on 16 September 2008. Retrieved 22 January 2009. ^ "AM Radio Tas". Aus Radio. Archived from the original on 9 October 2008. Retrieved 22 January 2009. ^ "Profile". Archived from the original on 12 September 2008. Retrieved 5 January 2009. ^ "Royal Flying Doctor Service". Retrieved 10 September 2008. ^ "Launceston Church Location". Archived from the original on 4 December 2008. Retrieved 5 January 2009. ^ "Road Network Statistics". Launceston City Council. Archived from the original on 2 March 2009. Retrieved 22 January 2009. ^ "Road Damage and Repairs". Launceston City Council. Archived from the original on 2 March 2009. Retrieved 22 January 2009. ^ "Passenger Route Services". Redline. Retrieved 1 November 2008. ^ "Public Transport". Launceston City Council. Archived from the original on 2 March 2009. Retrieved 22 January 2009. ^ "Road Network". Launceston City Council. Archived from the original on 2 March 2009. Retrieved 22 January 2009. ^ "Passenger Jet Services". Launceston Airport. Archived from the original on 19 July 2008. Retrieved 5 January 2009. ^ "Transport Supply". Tasmanian Government. Archived from the original on 19 August 2006. Retrieved 5 January 2009. ^ "Preserved Tasmanian Tramcars". Retrieved 29 August 2008. ^ "Launceston Tramway Museum Society Inc.- Lunceston's Trams". stors.tas.gov.au. Retrieved 6 February 2019. ^ "The Tasman Limited". Retrieved 22 November 2010. ^ "Launceston Gas Company". The Companion to Tasmanian History. Retrieved 26 December 2017. ^ ":: BORAL's First 60 Years ::". Boral.com.au. Archived from the original on 17 April 2010. Retrieved 2 April 2010. ^ "Gunns answers water supply critics – ABC News (Australian Broadcasting Corporation)". Australian Broadcasting Corporation. 19 September 2008. Retrieved 2 April 2010. ^ "Sister Cities". Launceston City Council. Archived from the original on 18 February 2011. Retrieved 16 February 2011. ^ "Marshall, Alexander Tasman". Parliament of Tasmania. 2005. Wooley, Charles; Tatlow, Michael (2007). Walk in Old Launceston: Your Guide to Two Wondrous Hours : Colonial Horrors, Heroism and Splendour. Walk Guides Australia. Wikivoyage has a travel guide for Launceston. Wikimedia Commons has media related to Launceston, Tasmania. Watch historical footage of Launceston, Burnie, Hobart and the rest of Tasmania from the National Film and Sound Archive of Australia's collection.